The years I invested in working with Dave Crenshaw were, without a doubt, the most fun, most productive and most valuable time I spent in and on my company. During our time, I grew to be a more focused leader, a calm thinker, and in the end, sold my company with victories for all that were involved. I don’t want to think how much harder it would have been without him in my corner. He genuinely cares about my success. If you’ve got the opportunity to work with Dave…do it. As my trusted business strategist, Dave has helped me focus on what matters. He has delivered 10x value in both time and money. He’s taken me from idea to launch in terms of growing my business, and it has positively impacted my work and life. Crenshaw has mastered the perfect recipe for small business success. This book rocks! Dave Crenshaw demonstrates how multitasking is, in fact, a lie that actually wastes time, energy, and money… ‘switchtasking’, as Dave calls it, not only uses up more of our resources, but it also diminishes our overall productivity. At Zappos.com, our core values include pursuing growth and learning, doing more with less, and building a positive team and family spirit. Dave’s message can resonate with anyone looking to live those values and make themselves invaluable. Dave has helped create structure through the SAM cycle, as well as keeping us focused from chasing every opportunity that comes up that will distract us from our core business model. The personal systems I have learned from Dave have allowed me to organize my life, reduce my stress levels, and strike a well-balanced work/home dynamic. I am a much happier person without all the chaos. You CANNOT afford not to work with Dave. The opportunity cost is too high! Dave’s coaching has helped my business run smoother, increase employee longevity and we’re much more profitable. Personally he has helped me finally find a life outside of work for the first time in over 20 years, it’s so refreshing. Any business owner who is struggling with getting everything done will benefit from working with Dave. It’s changed me and my company for the better. Jim Holbrook, President, Premier Plastics, Inc.
With Dave’s unique experience and insight he has helped me personally to become a better business owner, manager and more importantly a better person. I am living proof. When I started working with Dave a few years ago, I was personally doing so much in the company, but nothing was getting done very well. With Dave’s systems and counsel, I have been able to streamline our systems and processes which allowed me to bring in the right people to get the job done. I have more time now to drive the company direction and not be consumed by the day to day events within the business. I have gone from working 60-80 hours to 32 hours per week. I have more free time than ever before. I am very happy—and so is my wife! Dave, she thanks you, too. With the wide variety of challenges that I faced, I never stumped Dave. His seemingly countless solutions to the situation at hand were, to say the least, impressive. At times his coaching has also been a life saver. Dave has perfectly captured the sobering reality of an entrepreneurial existence. Follow his advice and your path to excellence and the ‘ultimate harvest’ will be more rewarding and a lot less stressful. I wish this book existed five years ago. This is the one book I wished I had when I first started out in business. The Focused Business is jam-packed with street-smart strategies to help you achieve success NOW. Crenshaw rips apart all your excuses and will jump-start you on your way to the profits you deserve! We live in an ADHD world. And I’m glad we do. But as Dave understands, the secret is to do one important thing at a time, with focus. If you can take the time to focus on his message, you’ll be glad you did. He has gotten us focused, and organized which are essential to any business that is growing. Dave has completely changed my time management and organization skills…I have total control of my schedule, both business and personal. It’s an absolute must for any business leader out there. He uses a realistic, modern and practical approach to leadership, organization and time management. Dave has helped our business revenue grow over 50% over the last year due to a successful expansion using processes he helped us develop. Dave’s accountability measures have stretched me as a business owner to get out of my comfort zone and face problems head on in our business. Even though his advice is hard to hear sometimes it … stretches my thinking and encourages me to do hard things. Dave most certainly does not allow me to become too comfortable (or work too much)…pushing me to make improvements that will not only benefit my business but my family as well. As someone who has lived the tale Dave Crenshaw tells, focus always triumphs over chaos! Don’t be attracted to all shiny objects; find the right object and make it shine! Invaluable bridges the gap between employee – manager relationships and productivity. Companies that implement this message not only stand to improve their bottom line but also make their work environments happier for everyone. Dave Crenshaw addressed our group on the topic of The Focused Business: How Entrepreneurs Can Triumph Over Chaos. The presentation was amazing. The nuggets of information that I took away from this session were worth the price of admission and then some. I would see him again in a heartbeat. It was amazing having Dave in Kuwait and it reflected positively on all the members that attended his session. He was direct and to the point and gave many tools which entrepreneurs took away to their daily business habits. He definitely left a lasting impression and an honor to have in our country. Dave Crenshaw recently spoke at EO Utah’s Business Convention. He did an excellent job presenting “The Myth of Multitasking” to the group. He was well-versed, enthusiastic, energetic, and came prepared. Dave spoke on a topic often overlooked in the workplace, and I think it shed some light on all of us business owners. I would highly recommend his services. Our meeting attendee survey proved him to be the top rated speaker … Dave’s presentation was inter-active, provided great solutions and really made people think about the positive changes they could make. I had Dave Crenshaw come to one of my events and speak to about four hundred of my members. Since that first event I’ve hired Dave again to come and do another session for my people because they just can’t get enough of him. Book him before someone else does. Dave is an awesome speaker who is able to connect with the audience in a unique way. Everyone left with a new perspective on what productivity really means. It is rare to leave a session with this many concrete steps to improve your business and your life. Dave’s advice and direction have refocused our efforts onto what really matters in our business…..saving us time, money and mental energy! Personally, this has freed up a lot of my time and energy. Only work with Dave if you are ready for honest, insightful, coaching. Dave will help you find the courage and drive to make changes- personally and professionally. As an early start-up, we had great enthusiasm, but were unfocused… Now, our business operates smoothly and scales seamlessly because of the systems Dave taught us to create, implement and integrate. In short, He taught me HOW to build my business, not simply get RUN by my business or RUN-OVER by my ideas. I do fewer things with greater focus. I have more peace. I would say, It depends… If you are ready to be stretched into a better person and smarter business owner, then yes, work with Dave. Dave Crenshaw’s systematic approach allowed me to be in a position to sell my business for a tremendous profit, on my terms, and gave me the freedom to focus on my family. He provided me with the tools I needed to grow and organize my business. I thank Dave for his patience, guidance and continual support. Dave has spent considerable time developing a program to help entrepreneurs be more productive. After a year of coaching with Dave my organization has dramatically improved our ability to focus, prioritize and execute on the critical activities that move the needle. I cannot recommend Dave or his approach enough. Dave is a trusted guide who has taught me to crush chaos in my business so I can focus on the summit. There are zero emails in my inbox and I feel 100% in control of my calendar and my life, with crystal clear focus on peak performance. Dave, thank you for helping me to become a better CEO. The view is great from the mountaintop. Tim McDonald, The Agency for Speakers & Entertainers, Inc.
We recommend Dave Crenshaw whenever we can. Dave is a consistent home run with our clients and delivers an educational and entertaining message that audiences react positively to. Dave consistently gets the highest scores in his evaluations. Dave Crenshaw has a knack for taking the complicated business models & decisions, and simplifying their management. He illustrates the ineffectiveness of multitasking, and helps business owners focus their efforts for maximum rewards. He is a force to be reckoned with, when it comes to the top speakers in the world. Our members loved Dave’s presentation so much we brought him back for a second time the following year! This year we were heard his newest message on how scheduling fun into your day can actually make you more productive. Our conference attendees loved the perspective Dave was able to bring and working with him and his team was a breeze. He’s a professional from start to finish. I would recommend Dave for your next conference or meeting. I asked Dave to come in and speak to a group of entrepreneurs at MIT. His message moved people emotionally and intellectually. Bravo! This is a refreshingly honest and inventive approach to small business! I love it. Invaluable is the next logical step in career development. This story will show you step-by-step how to increase your value in the market and increase workplace harmony. Dave did an exceptional job with the presentation…I would not hesitate recommending Dave Crenshaw as a speaker, [The Myth of Multitasking] is versatile for any profession! Larry Benet, Chief Connect of SANG and the author of "Connection Currency"
Over the years at SANG we have had some amazing speakers share the stage like Tony Robbins, Jack Canfield, Brian Tracy, Guy Kawasaki, David Allen, and I can honestly say that some of the things that Dave shared with our group has been some of the most impactful. Dave’s message is important and his delivery is powerful. You will be glad you hired Dave Crenshaw, I certainly was. Dave’s ability to help companies and entrepreneurs achieve their full potential is simply excellent. Dave spoke in Ghana at The Vodafone African Leadership Seminar and I must say I was humbled to part of his presentation in Ghana. Dave is clever, witty and relevant to these times. He speaks effectively and delvers an engaging presentation evidenced by an enthralled audience that did not stir. I recommend him to help increase your productivity. Simple but effective. Dave is an incredibly multi talented, dynamic and compelling individual. His take on topics such as multitasking was ‘invaluable’! I invited Dave to share his expertise at our annual Behind Every Leader event, and needless to say, I hope he will be a part of our stellar lineup for years to come. His breadth of knowledge and abundant skill set has been utilized by a global audience of CEO’s and Admin professionals. It was the best money spent this year. Jacob Hoehne, Chief Creative Officer, Issimo Productions, inc.
Dave has an uncanny way of knowing what ails most entrepreneurs. I’ve appreciated his insight as a business coach and I use him as an outsourced board of directors. Many of the recommendations he’s made have had a great impact on our efficiency and profitability. He’s helped not only the company but also on my own effectiveness as a leader. Dave is very knowledgeable with his craft and has a great way of teaching it to a variety of personalities. His insight and follow up is amazing. He teaches proven concepts that have been a great help to me personally and to my professional career. I never knew Dave before I hired him to help me. I now count him as a trusted friend. Dave’s unique system-oriented, yet personal approach to coaching and his breadth of experience has made all the difference. We’ve received demonstrable short term and long term payoff. Dave is truly a superhero! We asked Dave to be our opening Keynote speaker of our annual Summit attended by economic developers and local leaders. He adapted his humorous Myth of Multitasking presentation to meet the needs of the audience and it was well received. Our survey after the Summit showed that Dave was one of the most highly rated speakers we have had. Dave’s topic The Focused Business: How Entrepreneurs Can Triumph Over Chaos! was fantastic and on point! I had him speak at the EO Utah Chapter and the feedback I got about Dave was extremely positive. Dave has a simple and yet important message, which he delivers in a fun and entertaining way. Dave is enthusiastic, energetic and gets the audience engaged. You simply can’t go wrong by having Dave Crenshaw present at your meeting! He’s professional and personable. His material is absolutely outstanding. We will have him back! Dave Crenshaw is a true professional. His session, “The Myth of Multitasking” really resonated with our group. With an interesting interactive exercise, Dave was able to clearly demonstrate the adverse effects of multitasking and presented excellent points through out his talk. His high energy and delivery style was the perfect close to our event. 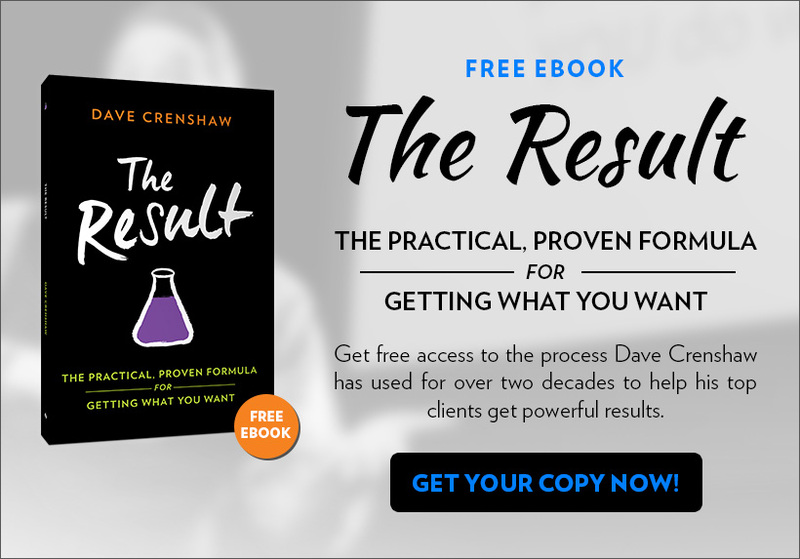 I recommend Dave Crenshaw whole-heartedly and am his advocate for any speaker presentation. Our group is a cross-section of business, education and community leaders in Northern Nevada. Dave Crenshaw has an entertaining and engaging delivery and his content was applicable for 100% of our attendees. Dave Crenshaw provided two very informative and entertaining seminars for our guests. He provides real life scenarios, great concepts that can be applied in all industries, and he brings humor and candor to the discussion. It’s been a wonderful experience. I really highly recommend it. Even just communicating with my husband has improved. It’s been wonderful. Just go for it and try it out. I now perform better as a business owner. My mind is free and I’m more organized. I couldn’t recommend Dave more highly. I’m thrilled with the investment, thrilled with the opportunity of working with him and being coached by him. I feel that Dave Crenshaw is on his path and on his way to becoming one of the great business minds of our generation. Dave definitely brings a fresh approach to finding that extra hour or two that we’re all looking for in a day. Not just in business but in our personal life as well…take the time to meet with Dave. As they say it takes money to make money, well with Dave it takes time to save it. Dave helped us to increase our revenues and help me to feel that I can handle the things that I have on my desk. I attended Dave’s Myth of Multitasking workshop July 16, 2015 hosted by the Kansas City EO chapter. I found the content to be some of the most practical and applicable I have experienced. I took away actionable next actions to better myself and my business. Dave came in Entrepreneur’s Organization St. Louis for Myth of Multi-Tasking with our spouses and Focused Business with the Business Owners. The amount of information he delivers with humor and insight is priceless. The path of the entrepreneur is littered with every imaginable personal and professional struggle. Thank you, Dave, for showing how to overcome that chaos as entrepreneurs journey toward success. Dave Crenshaw is spot on with his assessment that chaos is a business killer. If we weren’t able to focus and build the correct systems to avoid chaos, OtterBox wouldn’t be the industry leader in mobile device protection. A fresh take on the problem of timewasters in our corporate and personal lives, The Myth of Multitasking will change your paradigm about what is productive and what is not. I loved the concept of ‘switchtasking’ versus multitasking. Invaluable is operations excellence for small companies. Crenshaw’s easy-to- follow style explains practical methods for analyzing what one is doing and figuring out how to be more productive-more invaluable. I was blown away. I love his wisdom, I love his humor, I love his clarity, I love his examples and I’m a fan. I’m a raving fan. Dave’s the man. Dave’s material and presentation are top notch. I highly recommend Dave as a speaker/presenter to any group or organization. Dave Crenshaw has truly changed the way I get business done and deal with my family. With Dave’s system the results were immediate! My business and my family have benefited greatly from this increase in efficiency. Played 9 holes of golf today—all due to you, Dave. Dave helped free up at least thirty percent of my time. He radically advanced my organization and career. Simply amazing! Dave’s presentation was so interesting, informative and resonated deeply with the team. If every busy professional could internalize Crenshaw’s message… we’d all get much more done in less time. Crenshaw outlines a winning game plan for entrepreneurs in The Focused Business. Highly entertaining and enlightening! The things Dave he taught me literally gave me an extra two hours a day. I don’t even know how but my life has been so much easier and in control since. I have already recommended Dave to several business owners and will continue to do so in the future. Dave is amazing! I would highly recommend Dave to anyone needing to add time to their day and organization to their life. I’ve referred other people because I felt Dave was well worth the investment. It was exactly what I needed to leverage all the stuff that comes into my life at home and at work. As my business has grown, so have opportunities for growth and demands on my time. Like most entrepreneurs I often find it difficult to know when to say “no”. Dave’s program has helped me identify and focus on the “highest value” tasks and that has given me more time to explore the new opportunities and for myself and my family. It’s the one service I’ve paid for and utilized that I can refer without any hesitation whatsoever. Like most entrepreneurs, I have far more ideas than I have time to implement them, even with a great team in place. Dave’s program helped me reduce distractions, focus on high value tasks and run my business like a well-oiled machine. Now I reap the financial and emotional rewards of having more time to coach more people. Marcelo Felinto, Partner at Marffeli Consultoria Empresarial Ltda. I really recommend everyone invest some time to attend Dave’s trainings. Just few hours of your valuable time can make a big difference in your career. I can assure you that it’s worth it! Dave demonstrated why he is such an in-demand speaker and expert. He is practical, candid and avoids “consultant speak” while seriously impacting how we do our work. I had the opportunity to attend one of Dave’s workshops. He was specific in actions to take and not filled with fluff like so many other workshops I’ve attended. He gave me hope that I to with a little effort can become effective in my day to day activities. Dave is extremely patient. He is relentless in his efforts to help you improve, and he really cares about your success, both professional and personal. He has good business advice and a huge network of colleagues to draw from for any type of service or product you may need. Dave is as sincere a person as I have had the pleasure of woking with. Dave’s Boot Camp directed my focus on the most valuable tasks to achieve my careeer goals. It has created enough time for me to advance my education, work full time and still have quality time for myself and family. The rewards are worth the investment and effort. It’s been a couple of years and I have maintained all of the instructions that Dave Crenshaw helped me with. I saved myself so much time. Dave’s Get Time Boot Camp process is rock solid and immediately useful. The best thing though is Dave’s generosity and integrity. It is a pleasure to know and work with him. Dave is fantastic to work with! He is very professional and at the same time a very generous and fun person to work with. It’s a pleasure to recommend Dave. My wife and I are actually spending more quality time together, less time on unimportant things related to business. My family life has increased and improved. I feel in greater control of my business. I have learned how to control and use my time wisely. There’s not a day that I don’t say to myself that the teaching, the experience, the organization , the systems that Dave brought to the table taught me of been worth every cent that I paid him. Dave Crenshaw’s video series on time management, on how to make ourselves irreplaceable in the job and how to achieve our goals with a simple seven-point system is kept short and concise and immediately applicable. Moreover, it’s – thanks to Dave’s entertaining and enjoyable way of presentation – fun to follow. Dave’s tutorial on Time Management are great! His tips has changed my life! I strongly suggest his video tutorials in Lynda.com to every single human being on earth! Dave encouraged and taught me to start a small business. I’m still using his advice and still draw from his examples and ideas. Dave has my highest recommendation. I’m grateful for the techniques I learned with the Boot Camp because I am much more able to complete tasks on time, to be more focused and productive at the office, and I actually have more leisure time. If you take his advice, your work day life will be transformed, you will become more effective and valuable, and you will be focusing more on your most lucrative and meaningful activities. His ideas also work in your home and family life. It’s like a weight has been lifted off me. I was able to be much more organized. I highly recommend it. It’s worth every moment of your time and money. Dave is incredibly motivating and very knowledgeable about not only the theories behind productivity and becoming “invaluable” but also the technology that can be best used to accomplish the goals. Dave helped fine tune our business systems in a way that was objective yet tailored to our “uniqueness.” He also helped us address difficult decisions when they needed to be made. I highly recommend him. Prior to Dave’s program I was overwhelmed and losing the battle with all the “stuff” that I had to get done. Now I am able to be creative and focus my energy on my most enjoyable and profitable activities. Thanks, Dave! Paul Pugmire, Owner at Deja Blue, Inc. In just our first short discussion, Dave was able to help me see through the fog and chaos I brought him and give me tools to find my clarity. The value is more than financial, though I am certain that will be significant, it speaks to my sense of personal direction. Books, seminars, personal coaching… one way or another avail yourself to this rare and talented man.